With a fixed bridge and single humbucking pickup, this Kitty is ready to rock. Agathis body, maple 25-1/2"-scale neck, die-cast chrome machine heads, single volume control, jumbo frets, and a custom Hello Kitty pickguard. A great gift for aspiring girl rockers. 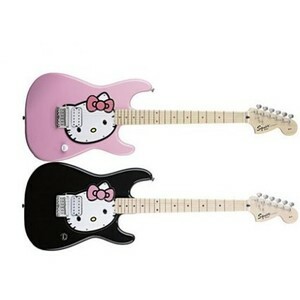 Order your Hello Kitty Strat right now!